Everyone is born with smooth, resilient skin. Your cells provide the “fingerprint” for this original beauty. Youthful skin renews itself consistently. Over time, healthy cell turnover slows dramatically. The result is visibly aging skin. Your original, beautiful skin doesn’t need to be a thing of the past. Introducing RENU Advanced, a one-of-a-kind anti-aging face care system. Get your best skin back with RENU Advanced. Youthful cells renew much quicker than aging cells. Active cellular communication is key for renewal of healthy, beautiful skin. Without redox signaling molecules, skin cells can’t communicate. ASEA’s patent-based redox signaling technology has been clinically proven to benefit cell communication and renewal for a healthy, youthful appearance. This icon indicates the presence of ASEA’s breakthrough redox signaling molecules in a product. This rich foaming cleanser tones and hydrates skin as it gently washes away dirt, oil, and impurities while leaving skin looking and feeling younger. Specifically formulated to support redox signaling technology. Gentle Refining Cleanser has earned Dermatest’s coveted 5-star clinically tested seal, its highest possible commendation for safety and efficacy. This benefit-packed moisturizer delivers deep hydration and anti-aging actives for a visibly youthful, vibrant appearance. Specifically formulated to support redox signaling technology. Ultra Replenishing Moisturizer has earned Dermatest’s coveted 5-star clinically tested seal, its highest possible commendation for safety and efficacy. Intensive Redox Serum is an ultra-concentrated anti-aging skin therapy designed to revitalize and support skin renewal. With powerfully acting redox signaling molecules, this facial serum targets even the most challenging imperfections associated with aging. Intensive Redox Serum has earned Dermatest’s coveted 5-star clinically tested seal, its highest possible commendation for safety and efficacy. Intensive Redox Serum is produced in an FDA-registered, NSF certified facility and is certified by an independent third-party lab to contain active redox signaling molecules. RENU 28 Revitalizing Redox Gel harnesses the power of redox signaling technology in a light, fast-absorbing gel designed to support healthy cell renewal. This whole-body skin therapy works to add smoothness, even texture, and revitalize skin health. Supports healthy circulation within minutes that may last for hours. RENU 28 Revitalizing Redox Gel has earned Dermatest’s coveted 5-star clinically tested seal, its highest possible commendation for safety and efficacy. 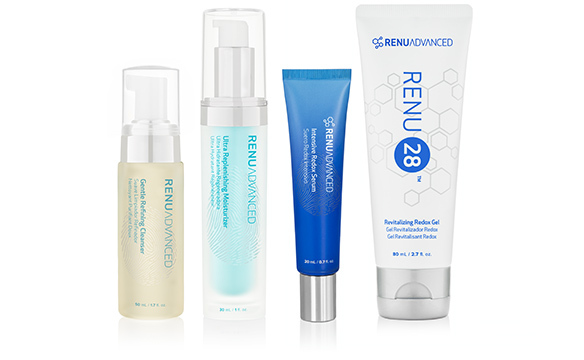 RENU 28 Revitalizing Redox Gel is produced in an FDA-registered, NSF certified facility and is certified by an independent third-party lab to contain active redox signaling molecules. ASEA has taken the best of science and nature to create RENU Advanced. This proprietary face care system provides all the benefits of redox signaling technology together with exclusive redox-friendly, anti-aging blends. RENU Advanced Gentle Refining Cleanser Tones and hydrates skin as it washes away dirt, oil, and impurities. RENU 28 Revitalizing Redox Gel “Everywhere” skin therapy that provides redox signaling molecules for smooth, toned skin. RENU Advanced Intensive Redox Serum Delivers ultra-concentrated redox signaling molecules to boost anti-aging benefits. RENU Advanced Ultra Replenishing Moisturizer Provides everyday moisture while delivering deep hydration and anti-aging actives for visibly youthful, vibrant skin. Please contact Associate Support with any inquiries.